Everyone wants to equip your home as much as possible, and make it as much as possible comfortable and inviting. And this appeal should begin with the outside. 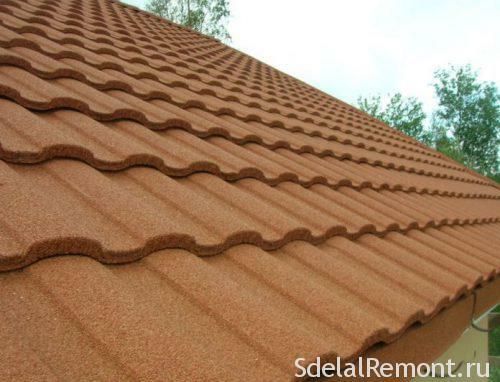 One element, who along with enclosing perform decorative function becomes the roof, and a good one for its coverage becomes tiling, which gives the building the beauty and elegance. But in order, to make the right choice, you need to know what happens Tiles, her views, features and advantages of. The first thing to understand, what constitutes this material, what features it carries in itself. The material itself is produced in the form of small bars. They are produced by calcining clay at a temperature of more 1000 degrees. The final weight of the material is approximately 4,5 kilogram. Each tile on the back side there ear or other device, through which the its attachment to a batten. Made on the modern equipment, such a ceramic tile cleaner for the house roof, extremely durable (its service life longer 100 years old) and moreover it has high decorativeness. It has acrylic coating, which, besides high decorativeness, It differs more and excellent protective properties: water resistance and frost resistance. 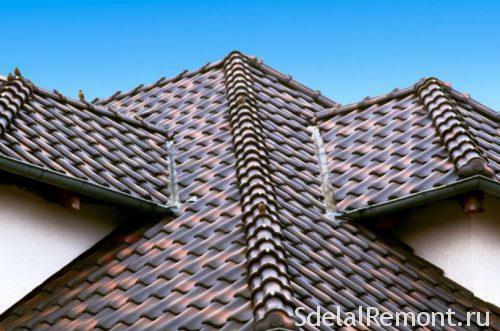 The cement-sand ridge tile can be, slot and dual. The dimensions of the slot tiles make up 420 x 334 x 12 mm, weight - 4,8-5 kg, ridge - 450 x 247/210 x 16/18 mm. All share two large groups - stamped and tape. Each of them has its species and is made of a single technology. Crevice, which provides some close, obespichivayuschie reliable coupling between the tiles. curved, represented as S axlebox. ridge (is divided into two kinds of, about it talk later). Band with a curved edge. belt with double curved edge, represented by two types of, such as "beaver tail" and "baking". complex, engagement in which the two or more ribs. Also there is another separate species, which is produced by molding. This is a fairly well-known type of products, which is popularly known as "beaver tail". Considering the differences from shingles, It noted a bright appearance, durability and greater resistance to moisture and ultraviolet rays. At the same time much cheaper option bituminous, easier to install and easier. The second subject for comparison, consider a composite shingles. It is designed as an analogue of a natural, in order to simulate its coverage. Since the main task it copes, Besides not inferior in durability, also more simple in arrangement and cheaper. Another advantage of getting no need to do crate and strengthen the system of rafters. The only thing, what better natural ceramic tiles - it's environmentally friendly and safe, while in other terms it yields. And the last view becomes a metal. It has a large number of varieties, more durable and less costs. Natural same material is more noble, Besides, It becomes a good shumoizolyatorom, in contrast to the noisy metal. follows, you need to know about the material, it is the structure and components. As mentioned, main component becomes natural clay, which lends itself to calcination. Additionally, to improve various performance properties are added plasticizers and builders. After baking in special furnaces material is as strong and firm. When tapping creates a distinctive ringing. Additionally, the top layer can be applied glaze. Ceramics has a high level of resistance to bending. It is not subject to destruction by freezing and thawing. Is not susceptible to chemicals and UV radiation. A high level of fire resistance and vapor resistance. It provides additional heat and sound insulation. great weight, that needs strengthening roof system. clay raw materials (tentatively be aged) crash, and then stirred with water and plasticizers. The material is then sent to the molding shop, where he was under pres molded or stamped. Further, firing is conducted in special ovens under the influence of temperature in 1000 degrees. After this cooling nproiskhodit natural way. Next, the product or remain in natural form, or covered with glaze. The majority of this kind of materials are used for private buildings. 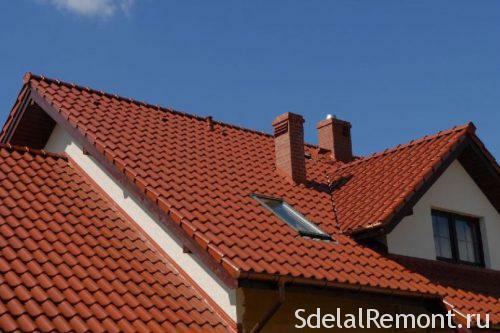 Covered tiled pitched and hipped roofs of all forms of. Further, in some cases, are used in the restoration of architectural monuments. When considering the cost of the material, you can note, sreednyaya the price varies 1400-1600 rubles per square meter. Sam figure depends on the complexity of the product and the manufacturer. Besides, you must take into account the cost of installation, which is approximately equal to the price of the material. Also pressing question recycling shingles. As it is well known ceramics - timeless material, because permissible, and subsequent use, after dismantling. Build a fence or households. construction. You can also make quite an attractive fence for a home beds. From small fragments obtained good drainage for plants. Besides it can be sold at a low price. Along with the standard ceramic tiles, it is worth noting one more natural look, this sand-cement products, them further. 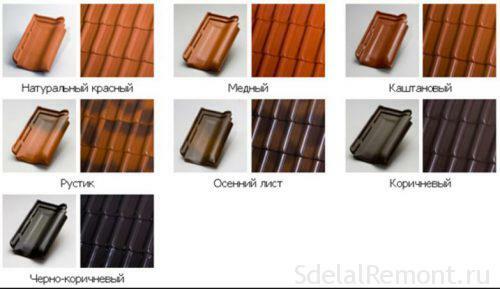 Produced cement-sand tiles of different colors. Paint it in two ways. The first method involves the introduction of a coloring pigment in the tiles during manufacturing. In the second method treats the surface of finished tiles - sprayed on her polymer emulsion or colored cement composition. Sometimes the surface of the tiles for the roof of the roof is sprinkled colored sand granulates. In most cases, staining is done in red and brown colors. Tile is divided into Alpine, venskuû and rimskuû. The first plane is produced, shingles and the latter two types has a three-dimensional shape. 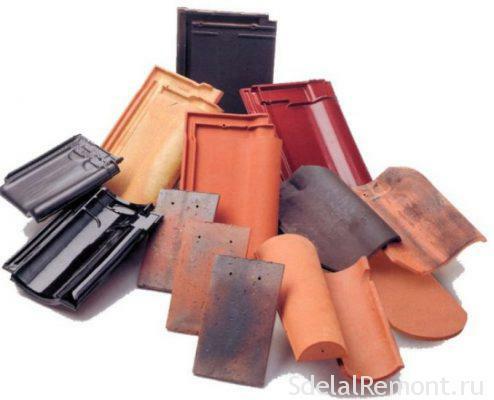 The service life of concrete roof tiles is much less, than ceramic. The advantages are its ease of implementation and low weight. Main types and important features we discussed, Now the choice is yours. Learn about the types of existing and roofing materials. And finally, it may be noted, that this kind of material is the most attractive, although quite expensive. In the same time, due to its durability, in the long term it will save. But the solution to arrangement of the roof of a material still remains for you. And finally, we offer a number of videos on the ceramic tile. Video: How to choose a roof. Characteristics of different types of roofing.